Author's Note: Hopefully this will be the first in a series of shorter descriptions that will add together to paint a picture of the background to DARC's upcoming presentation at L'Anse aux Meadows NHSC in August of 2010. These are most likely to presented here very much in a random order. Hope is to tie them together into a coherent package to be delivered at Forward Into the Past in late March. 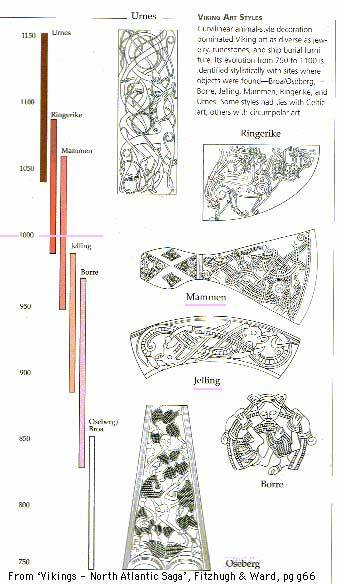 The table above is taken from 'Vikings - North Atlantic Saga' by Fitzhugh & Ward. Our time point is roughly 1000 AD. That puts things with MAMMEN as the primary style. RINGERIKE is still relatively new, and may not be seen outside the homelands. JELLING has just faded, but is likely to make up many of our 'older' objects. BORRE may exist in some heirloom objects. Most importantly, both OSEBURG (too old) and URNES (not started) style objects should not be included on decorative objects. There will likely more to be said about all this in upcoming posts. Art Imitates - well, US ! So you want to join DARC?